For learning purposes, code not meant to be used in production! Build process: create-react-app, prettier, etc. In the AWS Console, configure AWS S3 and AWS Route53 to establish static website hosting using a custom domain — see detailed instructions. Setup AWS CloudFront to serve the static website. See Host a Static Site on AWS, using S3 and CloudFront and then establish secure communication between the browser and web server Using HTTPS with CloudFront. 3. Clone, install, build, and deploy the web app. This is essentially optional. If you don’t want this you’ll need to remove the code in each of the Lambda functions that logs to this CloudWatch Log Group. The send-sms-verification-code Lambda function requires access to the Plivo API. Plivo API account authentication credentials are kept out of version control in a file called config.js. See the instructions in the project README for the expected format of this file. You should also consider using AWS Lambda’s environment variables feature to make these credentials available. For this size app it probably doesn’t really matter, but for larger projects I would look carefully at both options. Before creating the Lambda functions, you must edit the serverless.yml file, replacing < region > with your AWS region and < AWS Account ID > with your AWS account ID. This will also create new roles and policies for these Lambda functions. NOTE — at present Lambda does not support Node.js 7.x, so asyncawait is used to allow async await capability a la es7 in the Lambda functions. "phoneNumber": "< your testing phone number here >"
The Serverless framework covers AWS Lambda definitions and associated roles/policies. But AFAIK it doesn’t deal with Kinesis mappings to those functions. Once both your auth-send-sms-verification-code Lambda function and your Kinesis stream are defined, you’ll need to update your Lambda to be invoked when stream records occur in Kinesis. Once the mapping is created, it can be tested in the AWS Console using Actions > Configure Test Event OR by running the auth-request-verification-code function and using the CloudWatch logs to debug the flow through Kinesis. "verificationCode": "< your verification code >"
Use standard create-react-app testing methodologies, including unit tests and the local web deployment feature (yarn start) for dev and testing of the web app. Lambda functions can be tested manually using both the CLI and AWS Console. I used the AWS Console’s Lambda test invoke feature and CloudWatch Logs. A CloudWatch Log Group should be created automatically when you create the Lambda function. Unit testing is challenging in AWS Lambda. I didn’t write any unit tests for this project. The are important implications on overall code organization — see this Unit testing guide from Serverless for example — that I would pay attention to in larger production projects. This article is cross-posted on Medium. 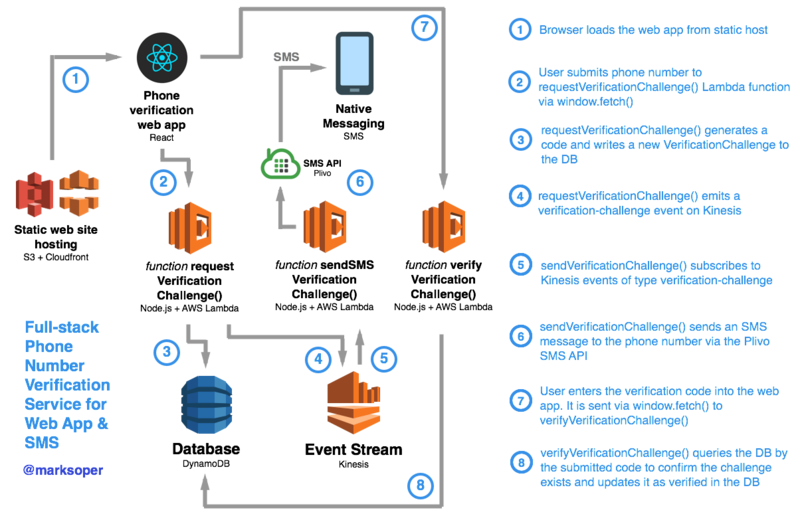 Please comment there at Phone number verification with event-driven microservices using AWS Lambda, Kinesis Streams, React.js.